Winter/Spring 2018 Newsletter - Pamela Morrison Pelvic Pain Physical Therapist, P.C. Winter/Spring 2018 Newsletter - Pamela Morrison Pelvic Pain Physical Therapist, P.C. 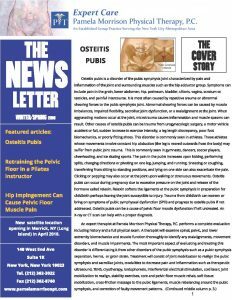 Featured articles include Osteitis Pubis, Retraining the Pelvic Floor in a Pilates Instructor, and Hip Impingement Can Cause Pelvic Floor Muscle Pain.